BARRY McCANN is a writer, speaker, performer and broadcaster. He regularly writes short stories for the Lancashire Evening Post and was recently included in the anthology His Red Eyes Again, published by The Dracula Society (and available on Amazon.) He regularly appears on BBC Radio Lancashire and is the Folklore Correspondent on BBC Radio Cumbria. He has also hosted two Ingrid Pitt – Queen of Horror Festivals in Hastings, having previously worked for the legendary actress as her researcher. At the time, it was declared “Lancashire’s Tutankhamen’s tomb”, and its discovery could not have been timelier. In late 2011, engineers were contracted by United Utilities to survey an area near Lower Black Moss reservoir by the village of Barley and in the shadow of Pendle Hill. When investigating a grass mound, they were surprised to unearth a 17th Century cottage, complete with the skeleton of a cat evidently placed there with deliberation. Archaeologists had been brought in by United Utilities to survey the grass mound, as is routine before turning the topsoil in areas believed to have archaeological significance. One of the archaeologists, Frank Giecco commented at the time “It’s like discovering your own little Pompeii. We rarely get the opportunity to work with something so well preserved. “As soon as we started digging, we found the tops of doors, and knew we were on to something special. The building was said to be in remarkable well preserved condition and contained a sealed room with the bones of a cat bricked into the wall, probably buried alive to protect the structure from evil spirits. Was this the witch’s cottage home to the Devices? Not surprisingly, speculation ran rife as to whether this was a witch’s cottage, in particular Malkin Tower, home of the Device’s. The building was thought to have originally been a pele tower, erected to guard against Brigand raids from the north. It became the residence of Elizabeth Southern, known as Demdike, her daughter Elizabeth and grandchildren Alizon, James and Jennet, all of whom were swept up in allegations of witchcraft. Demdike died in gaol while awaiting trial and the nine year old Jennet testified against the remaining family members at the 1612 Lancaster assizes, sealing their fate with the hangman. There is an assumption that following the trial and executions, Malkin Tower was deliberately demolished and foundations hidden because of its “evil” association, thus losing it to the mists of time. Apparently turning up just prior to the 400th anniversary of the Pendle Witch Trials seemed as if it wanted to be found. 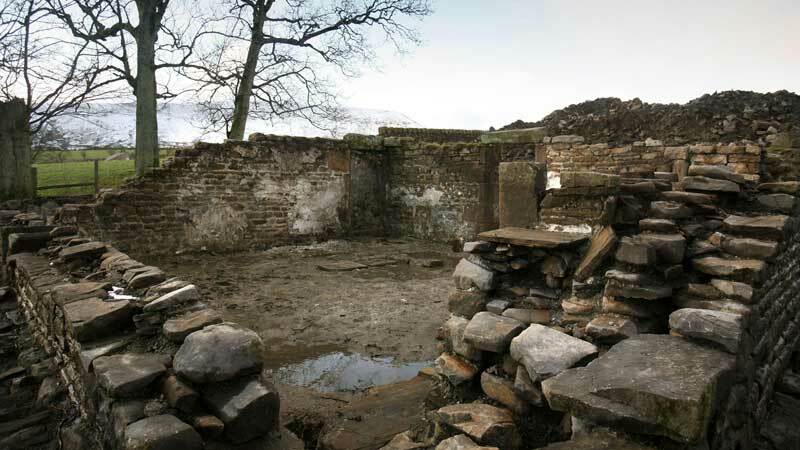 However, other sources suggest Malkin Tower was actually located south of Newchurch in the vicinity of Tynedale Farm and that the cottage now standing there, Lower Well Head, was built on its original foundations. Similarly, archaeologists subsequently brought in to investigate unearthed the building played down the witch connection, reporting that the building contained a 19th Century kitchen range and that Victorian crockery, a tin bath and a bedstead were discovered around the site, and they concluded it was more likely to have been home to a weaver. It does seem an odd decision to rebury such a historic find when it could have been cordoned off and put under protective cover, even turned into a tourist attraction like Stonehenge. And while it may have become a weaver’s cottage in later years, the presence of the mummified cat in its structure does point to a witch’s presence earlier in its existence. So, is there another reason the cottage was reburied? And will it return again? How the Welsh bury their dead: Superstitions and death in WalesA Beginners' Guide to Hauntings: How to tell a spirit from a ghost!